The set includes 2 freestanding lace machine embroidery designs. 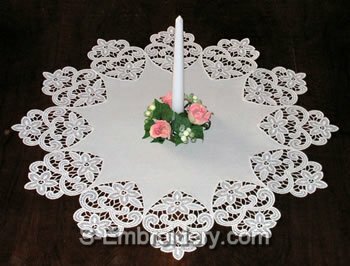 They can be used both separately and in combination to produce a free standing lace doily, table top or table cloth with a size that will fit your embroidery project. The images below show some possible applications of this freestanding lace embroidery set. 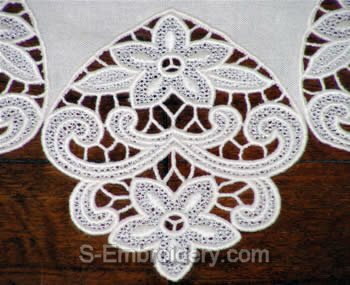 Our delivery includes an information file and instructions on the producing the doily, featured on this page (both in PDF format) as well as 2 machine embroidery files.